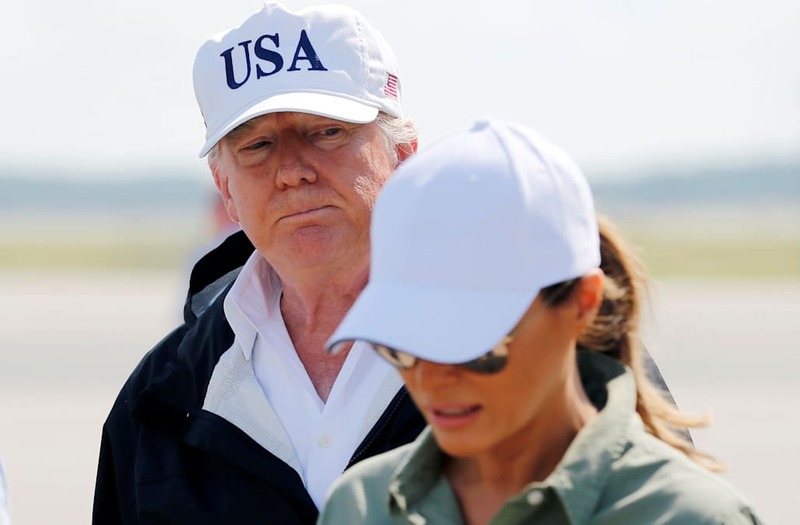 A video showing President Donald Trump making a somewhat confusing comment about first lady Melania Trump on September 14 has gone viral. The incident occurred during a visit to Fort Myers, Florida. In the clip, Trump can be heard telling reporters at a briefing about Hurricane Irma recovery efforts, "I just want to thank everybody, the first responders, on behalf of myself, our vice president." "Melania really wanted to be with us. It’s really touched her heart what’s gone on," he continued. But the video clip of the event, which has since garnered millions of views, shows the first lady standing next to the president as he makes the remarks. Her expression doesn’t seem to change until she acknowledges a woman who appears to pat her on the back soon after. The reactions on social media have been mixed. "Wow he didn’t recognize her. See I knew there was a reason she wore that FLOTUS hat," tweeted one user. Others suggested he simply misspoke. "I think he was saying that she felt strongly about making the trip with him," one said. "He’s just awkward with words," another agreed. Meanwhile, others were critical of the president and sympathetic to the first lady. "It's no wonder she can’t stand him! #FreeMelania," a tweet read. "I legit feel bad for his wife," another person commented.